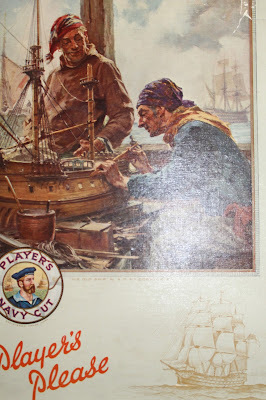 Waterford County Museum: Object of the Week - Card Poster for Player's Cigarettes with a reproduction of an oil painting 'His Old Ship' by A D McCormack. Late 1920s. Object of the Week - Card Poster for Player's Cigarettes with a reproduction of an oil painting 'His Old Ship' by A D McCormack. Late 1920s. Arthur David McCormack was born in Coleraine in 1860 and attended the Royal College of Art. The painting featured here is in the collection of Coleraine Museum. He also painted a head of a sailor in 1927 for another Player's advert.